The Provisions of Oxford was the older Briton model still existent in the minds of England after the conquest, manifesting itself through those still in sympathy with it over the more aggressive feudal regime. Though a sure advancement in the rights of those other than the king, it was perhaps the first move to protect the lords down to the freemen, it was not about freeing the English people from their yoke. It can however be seen as the first move to form a government with the sole aim of protecting the rights and property of Englishmen and to perform a service through taxation to that end. Today, what we call government is no such thing, they are a legal instrument of the ultimate corporation on these lands, the Crown, and through a serious deception played in the legal jurisdiction, the Englishman belongs to the government. Study. A plan of reform accepted by Henry III, in return for the promise of financial aid from his barons. It can be regarded as England’s first written constitution but not the first constitution. 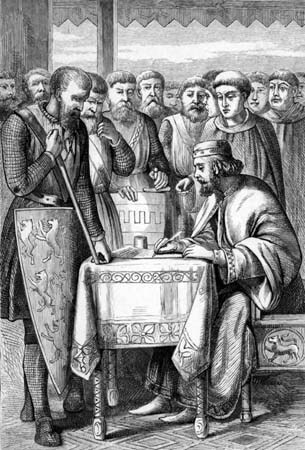 Henry, bankrupted by a suspect venture in Sicily, summoned Parliament in the spring of 1258 (the Easter Parliament, or the so-called Mad Parliament). In return for a badly needed grant of revenue, Henry grudgingly agreed to abide by a program of reform to be formulated by a 24-man royal commission, half of whom were to be chosen by the king, half by the baronial party. The report of the commission (issued c. June 10) is known as the Provisions of Oxford. The Provisions, confirmed by an oath of community of the magnates, were to remain in effect for 12 years and provide the machinery through which the necessary reforms could be accomplished. The government was placed under the joint direction of the king and a 15-member baronial council that was to advise the king on all important matters. All high officers of the realm were to swear allegiance to the king and the council. Parliament was to meet three times a year to consult on further reforms. A justiciar was appointed (for the first time since 1234) to oversee local administration, and the majority of sheriffs were replaced by knights holding land in the shires that they administered. Annulled by papal bulls in 1261 and 1262 and by Louis IX of France in the Mise of Amiens (January 1264), the Provisions were restored by baronial action in 1263 and, in modified form, in 1264 but finally annulled by the Dictum of Kenilworth (October 1266). It has been provided that from each county there shall be elected four discreet and lawful knights who, on every day that the county [court] is held, shall assemble to hear all complaints touching any wrongs and injuries inflicted on any persons by sheriffs, bailiffs, or any other men, and to make the attachments that pertain to the said complaints [for keeping] until the first arrival of the chief justiciar in those parts: so that they shall take from the plaintiff adequate pledges for his prosecution [of the case], and from the defendant for his coming and standing trial before the said justiciar on his first arrival; and that the four knights aforesaid shall have all the said complaints enrolled, together with their attachments, in proper order and sequence namely, for each hundred separately and by itself so that the said justiciar, on his first arrival, can hear and settle the aforesaid complaints singly from each hundred. And they shall inform the sheriff that they are summoning all his hundredmen and bailiffs before the said justiciar on his next arrival, for a day and a place which he will make known to them: so that every hundredman shall cause all plaintiffs and defendants of his bailiwick to come in succession, according to what the aforesaid justiciar shall bring to trial from the aforesaid hundred; also as many men and such men both knights and other free and lawful men as may be required for best proving the truth of the matter. [This, however, is to be done] in such a way that all are not troubled at one and the same time; rather let [only] as many come as can be [used in cases to be] tried and concluded in one day. Likewise it is provided that no knight of the aforesaid counties, by virtue of an assurance that he is not to be placed on juries or assizes, shall be excused by a charter of the lord king or be exempt from [the obligations of] this provision thus made for the common good of the whole kingdom. Elected on the part of the lord king: the lord bishop of London; the lord bishop elect of Winchester; the lord H[enry], son of the king of Germany; the lord J[ohn], earl de Warenne; the lord Guy de Lusignan; the lord W[illiam] de Valence; the lord J[ohn], earl of Warwick; the lord John Mansel; Brother J[ohn] of Darlington; the abbot of Westminster; the lord H[enry] of Hengham. Elected on the part of the earls and barons: the lord bishop of Worcester; the lord Simon, earl of Leicester; the lord Richard, earl of Gloucester; the lord Humphrey, earl of Hereford; the lord Roger Marshal; the lord Roger de Mortimer; the lord J[ohn] Fitz-Geoffrey; the lord Hugh le Bigot; the lord Richard de Gray; the lord W[illiam] Bardulf; the lord P[eter] de Montfort; the lord Hugh le Despenser. And if it should happen that of necessity any one of these cannot be present, the rest of them shall elect whom they please in place of the absentee, namely, another person needful for carrying on that business. The twelve on the king’s side have chosen from the twelve on the side of the community the earl Roger Marshal and Hugh le Bigot. And the party of the community has chosen from the twelve who are on the side of the king the earl of Warwick and John Mansel. And these four have power to elect the council of the king; and when they have made the election, they shall designate those [elected] to the twenty-four. And that shall hold on which the majority of these [four] agree. These are the twelve who have been elected by the barons, on behalf of the whole community of the land, to consider common needs along with the king’s council at the three annual parliaments. These are the twenty-four appointed by the community to consider aid for the king. And if any one of these cannot or will not be present, those who are present shall have power to elect another in his place. Concerning the state of Holy Church: It should be remembered that the state of Holy Church is to be amended by the twenty-four chosen to reform the state of the kingdom of England at what time and place they think best, according to the powers that they hold by writ of the king of England. Concerning the chief justice: [It has been decided] furthermore that a chief justice or two [chief justices] shall be appointed; also what power he shall have; and that he shall be [in office] for only one year, so that at the end of the year he shall render account of his term before the king and the royal council and before the man who is to follow him [in office]. Concerning the treasurer and the exchequer: The same [has been decided] with regard to the treasurer; so that he shall render account at the end of the year. And according to the ordinance of the said twenty-four, other good men are to be appointed to the exchequer, whither all the issues of the land are to come, and not elsewhere. And let that be amended which seems in need of amendment. Concerning the chancellor: The same [has been decided] with regard to the chancellor; so that he shall render account of his term at the end of the year, and that merely by the king’s will he shall seal nothing out of course, but shall do so by [the advice of] the council that surrounds the king. Concerning the power of the justice and of the bailiffs: The chief justice has power to redress the misdeeds of all other justices, of bailiffs, of earls, of barons, and of all other people, according to the rightful law of the land. And writs are to be pleaded according to the law of the land in the proper places. And [it has been decided] that the justices shall accept nothing unless it is a present of bread and wine and like things: namely, such meat and drink as have been customarily brought for the day to the tables of the chief men. And this same regulation shall be understood [to hold] for all the king’s councillors and all his bailiffs. And [it has been ordered] that no bailiff, by virtue of his office or of some plea, shall take any fee, either by his own hand or in any manner through another person. And if he is convicted [of so doing], let him be punished; likewise the man who gives [the fee]. And the king, if it is suitable, shall give [fees] to his justices and to his people who serve him, so that they shall have no need of taking anything from others. Concerning the sheriffs: As sheriffs there shall be appointed loyal persons, good men who are landholders; so that in each county there shall be as sheriff a feudal tenant of the same county, who shall well, loyally, and justly treat the people of the county. And [it is ordered] that he shall take no fee; that he shall be sheriff for no more than a year in all; that during the year he shall render his accounts at the exchequer and be responsible for his term [of office]; that the king, from the royal income, shall make [allowance] to him in proportion to his receipts, so that he may rightly keep the county; and that he shall take no fees, neither he nor his bailiffs. And if they are convicted [of such wrongdoing], let them be punished. It should be remembered that, with regard to the Jewry and the wardens of the Jewry, such reforms are to be established as shall carry out the oath in this respect. Concerning the escheators: Good escheators are to be appointed. And [it is ordered] that they shall take nothing from goods of deceased persons whose lands ought to be in the king’s hands; but that, if a debt is owing to him, the escheat ors shall have free administration of the goods until they have carried out the king’s wishes and this according to the provision in the charter of liberties. Also [it is ordered] that inquiry shall be made concerning the misdeeds committed there by escheators, and that redress shall be made for such [wrongs]. Nor shall tallage or anything else be taken, except as it should be according to the charter of liberties. The charter of liberties is to be strictly observed. Concerning the exchange of London: It should be remembered to establish reforms touching the exchange of London; also touching the city of London and all the other cities of the king, which have been brought to shame and ruin by tallages and other oppressions. Concerning the household of the king and queen: It should be remembered to reform the household of the king and queen. Concerning the parliaments, as to how many shall be held annually and in what manner: It should be remembered that the twenty-four have ordained that there are to be three parliaments a year: the first on the octave of St. Michael, the second on the morrow of Candlemas, and the third on the first day of June, that is to say, three weeks before [the feast of] St. John. To these three parliaments the chosen councillors of the king shall come, even if they are not summoned, in order to examine the state of the kingdom and to consider the common needs of the kingdom and likewise of the king; and by the king’s command [they shall come] also at other times, whenever it is necessary. So too it should be remembered that the community is to elect twelve good men, who shall come to the three parliaments and at other times, when there is need and when the king and his council summon them to consider the affairs of the king and the kingdom. And [it has been decided] that the community shall hold as established whatever these twelve shall do and this is to reduce the cost to the community. Fifteen are to be named by these four men that is to say, by the earl Marshal, the earl of Warwick, Hugh le Bigot, and John Mansel who have been elected by the twenty-four to name the aforesaid fifteen, who are to form the king’s council. And they are to be confirmed by the aforesaid twenty-four, or by the majority of those men. And they shall have the power of advising the king in good faith concerning the government of the kingdom and concerning all matters that pertain to the king or the kingdom; and of amending and redressing everything that they shall consider in need of amendment or redress. And [they shall have authority] over the chief justice and over all other people. And if they cannot all be present, that shall be firm and established which the majority of them shall enact. These are the names of the principal castles of the king, and of those who have charge of them. 1. With regard to the performance of suit to the courts of the magnates and of other lords who have such courts, it is provided and established by general agreement that no one who is enfeoffed by charter shall henceforth be distrained to perform suit to his lord’s court, unless he is specifically obliged by the tenor of his charter to perform the suit; with the sole exception of those whose ancestors were accustomed to perform suit of this kind, or who themselves [were accustomed so to do], before the first crossing of the said lord king into Brittany after the time of which crossing twenty-nine and a half years had elapsed down to the time that this constitution was made. And likewise no one enfeoffed without charter since the time of the Conquest, or by other ancient enfeoffment, shall be distrained to perform suit of this kind, unless he or his ancestors were accustomed to perform it before the first crossing of the lord king into Brittany. 4. With regard to the sheriff’s torn, it is provided that, unless their presence is specially demanded, archbishops, bishops, abbots, priors, earls, and barons, or other men of religion, or women, shall not of necessity come thither. And the tourns shall be held according to the form of the king’s Great Charter, and as they were customarily held in the time of the kings John and Richard. 5. It is also provided that neither on the eyres of the justices nor in the [courts of the] counties nor in the courts of barons shall fines henceforth be taken from anybody for miskenning, or for avoidance of trouble on that score. 8. Moreover, with regard to charters of exemption and liberty, [to the effect] that those securing them are not to be put on assizes, juries, or recognitions, it is provided that, if their oath is so essential that without it justice cannot be administered, they shall be forced to swear, saving to them their aforesaid liberty and exemption in other respects. 11. Henceforth no one except the lord king and his ministers shall be permitted, for any cause whatsoever, to levy distraints outside his fief, or on a royal or a common highway. 16. Hereafter no one but the king shall hold in his court a plea concerning false judgment rendered in a court of his tenant; for pleas of this sort especially pertain to the crown and dignity of the king. 18. Without the king’s writ, no one may henceforth distrain his free tenants to respond concerning their free tenements or anything that pertains to their free tenements. Nor may he cause his free tenants against their will to take oaths; so that no one may do this without the king’s precept. 21. Hereafter itinerant justices shall not amerce vills on their eyries because particular twelve-year-old persons do not come before sheriffs and coroners for inquests concerning a man’s death or other matters pertaining to the crown; so long as, nevertheless, enough men come from those vills for satisfactorily carrying out such inquests. 22. No judgment of murder shall henceforth be rendered before the justices in a case that is adjudged merely one of accident; but [a judgment of] murder shall be proper in the case of a man feloniously slain, and not otherwise. From the 14th to the 17th century, the Renaissance was period marked by the revival of intellectual life, based within the parameters as set by the Gnostic mysticism. During this period there was a revival of ancient Greek thought, the establishment of the idea of individual rights, and the application of republicanism as in the case of Venice. The founders of the USA looked to the script as set by the Renaissance for their ideas of individual rights, and the establishment of republicanism, though in Thomas Jefferson, America had a serious player for the empire of the Carolingian, the purveyors of the fascist feudal system in order their manor is ruthlessly corralled. After the Renaissance came the Reformation upon the back of the fire and brimstone master, Martin Luther. During this time people began to challenge the practices of the Roman Catholic church, and so the reformers broke away and began to form their own churches, but it didn’t stop there some reformers began to question these newly established churches. The American Colonies were settled mainly by people looking to worship in there own way, and became the perfect testing ground for chaos with consent coming from the Mayflower compact signed in 1620 was the first governing document of Plymouth Colony, and was an early example of social contract theory. Many historians have referred to the Mayflower compact as the foundation of the U.S. constitution. This compact, written by some of the first English settlers in America, set the basis for American Government. So Francis bacon had it quite correct when he termed the American adventure as the New Atlantis in his book. The Petition of right was an important document passed by parliament in 1628.It’s most notable principles included were that taxes can be levied only by parliament, in times of peace martial law cannot be employed, and prisoners can challenge there imprisonment through habeas corpus. Also it banned the billeting of troops. John Locke born August 1632 was an English philosopher. Locke believed that the major role of government was to protect private property. He said that every one was created equally with natural rights, and that kings had no divine right to govern. Locke also advocated the separation of powers in government. The Year is 1689 and parliament has just passed the English Bill of Rights, which included freedom from royal interference of law, freedom from taxation by Royal prerogative, freedom to petition the monarch, freedom from the standing army during a time of peace, freedom for protestants to bear arms in defence, as suitable to there class and as allowed by law, freedom to elect parliament without interference from the sovereign, and freedom of speech and debates. The Dictum of Kenilworth, issued 31 October 1266, was a pronouncement designed to reconcile the rebels of the Barons War with the royal government of England. After the baronial victory at the Battle of Lewes in 1264, Simon de Montfort took control of royal government, but at the Battle of Evesham the next year Montfort was killed, and King Henry III restored to power. A group of rebels held out in the stronghold of Kenilworth Castle, however, and their resistance proved hard to crush. A siege of the castle was started, but through papal intervention King Henry later entered on a more conciliatory path. A commission was appointed to draw up an arrangement that would be acceptable to both sides. The resulting Dictum of Kenilworth offered the rebels the right to buy back forfeited estates, at prices depending on their level of involvement in the rebellion. After initial resistance, the terms were eventually accepted. By the summer of 1267, the country was pacified, and this spirit of reconciliation would last until the 1290s. The Dictum of Kenilworth was later incorporated into the Statute of Marlborough. The Statute of Marlborough (52 Hen 3) was a set of laws passed by King Henry III of England in 1267. There were twenty-nine chapters, of which four are still in force. The full title was Provisions made at Marlborough in the presence of our lord King Henry, and Richard King of the Romans, and the Lord Edward eldest son of the said King Henry, and the Lord Ottobon, at that time legate in England. It is so named as it was passed at Marlborough, where a Parliament was being held. The preamble dates it as the two and fiftieth year of the reign of King Henry, son of King John, in the utas of Saint Martin, which would give a date of November 19, 1267; utas is an archaic term to denote the eighth day after an event, in this case the feast day of Saint Martin. It is the oldest piece of statute law in the United Kingdom that has not yet been repealed. The chapters currently valid are c.1, c.4, & c.15 (often referred to as the Distress Act 1267), which seek to govern the recovery of damages (distresses) and make it illegal to obtain recompense for damages other than through the courts, and c.23 (the Waste Act 1267), which seeks to prevent tenant farmers from making waste to land they are in tenancy of. Chapter 15 sets out places in which distresses are forbidden to be taken; these include the King’s Highway and the Common Street. In other words, actions to remedy a breach of some kind by one person against another may not be taken in the street etc. Repealed chapters include legislation on resisting the King’s officers, the confirmation of charters, wardship, redisseisin, suits of court, Sheriff’s turns, beau pleader, real actions, essoins, juries, guardians in socage, amercements for default of summons, pleas of false judgement, replevin, freeholders, inquest, murder, benefit of clergy, and prelates.